Yesterday, CUP political party held a general assembly to determine whether to support or not Artur Mas's candidacy to President of the Catalonian regional government. The final voting round among 3,030 representatives ended up in an exact 1,515/1,515 tie, leaving the question unsolved for the moment being. Such an unexpected result has prompted a flurry of Internet activity about the mathematical probability of its occurrence. If a proportion p of CUP voters are pro-Mas, how likely is it that a random sample based on 3,030 individuals yields a 50/50 tie? The simple answer (assuming the number of CUP voters is much larger that 3,030) is Pp(1,015 | 3,030), where Pp(n | N) is the binomial distribution of N Bernouilli trials with probability p resulting in exactly n successes. The figure shows this value for 40% ≤ p ≤ 60%. At p = 50%, which without further information is our best estimation of pro-Mas supporters among CUP voters, the probability of a tie is 1.45%. A deviation in p of ±4% would have made this result virtually impossible. If a proportion p of CUP voters are pro-Mas, how likely is a random sample of 3,030 individuals to misestimate the majority opinion? where Ip(a,b) is the regularized beta function. 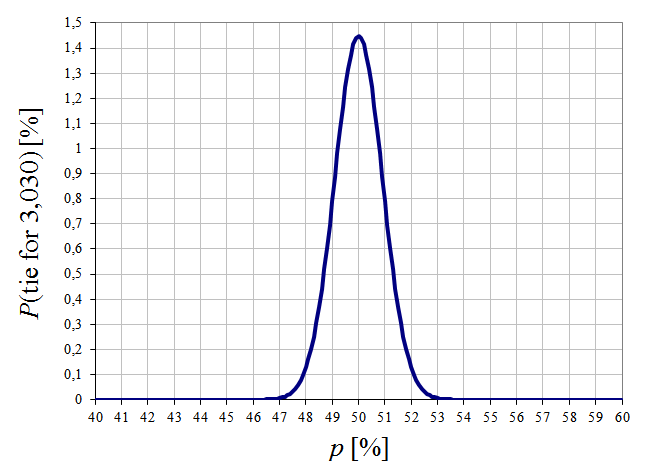 The figure shows the corresponding graph for 3,030 representatives and 40% ≤ p ≤ 60%. 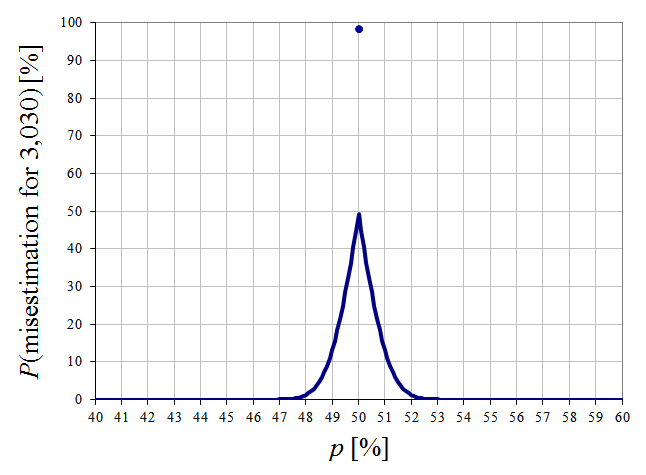 The function shows a discontinuity at the singular (and zero-probability) event p = 50%, in which case the assembly will yield the wrong result always except for the previously studied situation that there is an exact tie (so, the probability of misestimation is 1 − 1.45% = 98.55 %). Other than this, the likelihood of misestimation approaches 49%+ as p tends to 50%. We have learnt that CUP voters are almost evenly divided between pro- and anti-Mas: if the difference between both positions is 0.7% or less, an assembly of 3,030 representatives such as held yesterday will fail to reflect the party's global position in more than 1 out of 5 cases. Note that particles are inserted into the container using emplace_back rather than push_back: this is due to the fact that a particle object (which push_back accepts as its argument) cannot be created out of the blue without its constituent members being previously stored somewhere; emplace_back, on the other hand, does not suffer from this chicken-and-egg problem. dod::vector<Class<Members...>> derives from an implementation class that holds a std::vector for each of the Members declared. Inserting elements is just a simple matter of multiplexing to the vectors, and begin and end return dod::pointers to this structure of arrays. From the point of view of the user all the necessary magic is hidden by the framework and DOD processing becomes nearly identical in syntax to OOP. We provide a test program that exercises dod::vector against the classical OOP approach based on a std::vector of plain (i.e., non DOD) particles. Results are the same as previously discussed when we used DOD with manual initialization, that is, there is no abstraction penalty associated to using dod::vector, so we won't present any additional figures here. access<Members...> just considers the case where each member is stored separately. Sometimes the most efficient layout will call for mixed scenarios where some of the members are grouped together. This can be modelled, for instance, by having member accept multiple pieces of data in its declaration. dod::pointer does not properly implement const access, that is, pointer<const particle<...>> does not compile. dod::vector should be implemented to provide the full interface of a proper vector class. All of this can be in principle tackled without serious design dificulties. In a past entry, we implemented a little C++ framework that allows us to do DOD while retaining some of the encapsulation benefits and the general look and feel of traditional object-based programming. We complete here the framework by adding a critical piece from the point of view of usability, namely the ability to process sequences of DOD entities with as terse a syntax as we would have in OOP. Once the containers are populated and beg_ and end_ defined, user code can handle particles as if they were stored in [beg_, end_), thus effectively isolated from the fact that the actual data is scattered around different containers for maximum processing performance. Even though traversal code is in principle equivalent to hand-written DOD code, compilers might not be able to optimize all the template scaffolding away. Traversing with access<color,x,y,dx,dy> for rendering when only color, x and y are needed (because render does not access dx or dy) involves iterating over dx_ and dy_ without actually accessing either one: again, the compiler might or might not optimize this extra code. 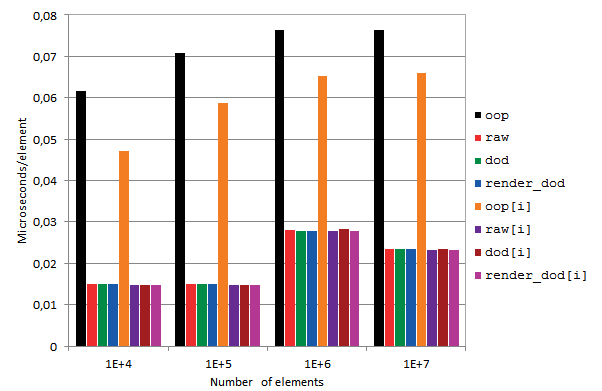 The difference between dod and render_dod (and the same applies to their index-based variants) is that the latter keeps access only to the data members strictly required by render: if the compiler were not able to optimize unnecessary pointer manipulations in dod, render_dod would be expected to be faster; the drawback is that this would require fine tuning the access entity for each member function. 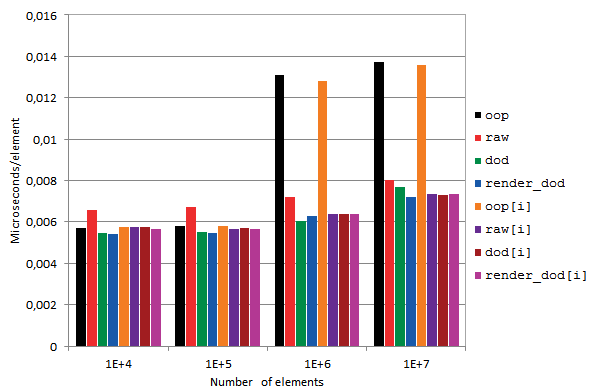 The figures show the release-mode execution times of the eight options described above when traversing sequences of n = 104, 105, 106 and 107 particles. 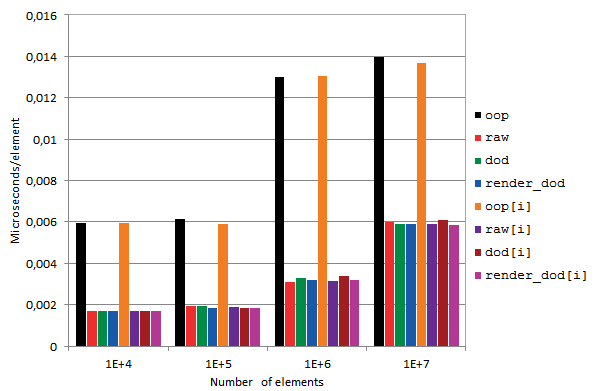 Execution times / number of elements. As expected, OOP is the slowest due to cache effects. The rest of options are basically equivalent, which shows that GCC is able to entirely optimize away the syntactic niceties brought in by our DOD framework. Here, again, all DOD options are roughly equivalent, although raw (pointer-based hand-written loop) is slightly slower. Curiously enough, MSVC is much worse at optimizing DOD with respect to OOP than GCC is, with execution times up to 4 times higher for n = 104 and 1.3 times higher for n = 107, the latter scenario being presumably dominated by cache efficiencies. 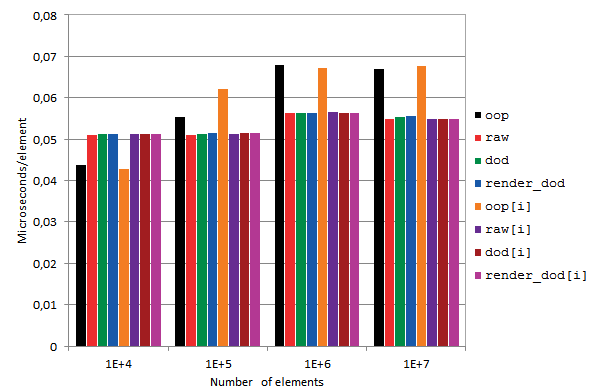 From a qualitative point of view, these results are in line with those obtained for GCC 5.1 under an Intel Core i7, although as the AMD A6 is a much less powerful processor execution times are higher (×8-10 for n = 104, ×4-5.5 for n = 107). As it happens with the rest of compilers, DOD options (both manual and framework-supported) perform equally well. However, the comparison with GCC 5.2 on the same machine shows important differences: iterator-based OOP is faster (×1.1-1.4) in Clang, index-based OOP yields the same results for both compilers, and the DOD options in Clang are consistently slower (×2.3-3.4) than in GCC, to the point that OOP outperforms them for low values of n. A detailed analysis of the assembly code produced would probably gain us more insight into these contrasting behaviors: interested readers can access the resulting assembly listings at the associated GitHub repository. allows the needed data, and only this, to be cached in three parallel cache lines, thus maximizing occupancy and minimizing misses. For the moving loop, it is a different set of data vectors that must be provided. DOD is increasingly popular, in particular in very demanding areas such as game programming. Mike Acton's presentation on DOD and C++ is an excellent introduction to the principles of data orientation. The problem with DOD is that encapsulation is lost: rather than being nicely packed in contiguous chunks of memory whose lifetime management is heavily supported by the language rules, "objects" now live as virtual entities with disemboweled, scattered pieces of information floating around in separate data structures. Methods acting on the data need to publish the exact information they require as part of their interface, and it is the responsibility of the user to locate it and provide it. We want to explore ways to remedy this situation by allowing a modest level of object encapsulation compatible with DOD. Providing a public interface (a set of member functions) acting on the associated data. Keeping access to the data and managing its lifetime. Turn the class into a class template dependent on an access entity from which it derives. Rather than declaring internal data members, define the corresponding member labels. Delete former OOP constructors define just one constructor taking an access object as its only data member. For convenience's sake, provide a make template function (in the example make_particle) to simplify object creation. so that the resulting objects can take advantage of the entire particle interface. In later entries we will see how this need not affect performance in traversal algorithms. A nice side effect of this technique is that, when a DOD class is added extra data, former code will continue to work as long as this data is only used in new member functions of the class. A C++11 example program is provided that puts to use the ideas we have presented. Traversal is at the core of DOD, as the paradigm is oriented towards handling large numbers of like objects. In a later entry we will extend this framework to provide for easy object traversal and measure the resulting performance as compared with OOP. In the United States, digital advertising spend amounted to $49.5B or 0.3% of the country's GDP, roughy $155 per person. Figures for Spain are more modest: €1.1B or €23 per person. Online providers' net income I is reduced by some quantity Ic that is directly received by users themselves. Consumer income Y is added Ic and detracted some unkown quantity L resulting from online provider's lower dividends (if any, as currently neither Google nor Facebook pay them), reduced market cap, adjustments in employees' salaries, etc. The key aspect is that, even if Ic = L and so Y remains the same, this redistribution will benefit lower-income residents, with a net effect of higher overall consumption because these people pay proportionally less taxes T (so, the national disposable income Yd grows) and have higher marginal propensity to consume MPC. Higher consumption increases demand and supply and produces a net gain in GDP (and online ad spending in its turn). ΔA = (ΔA/ΔC) · ΔMPC · Δ(Y − T). Tax avoidance practices by big online providers basically take all their income out of some countries (Spain, for instance) to derive it to others where taxes are lower. For the losing countries, redistribution of ad revenues among their residents is a win-win as their national economies receive no input from online providers to begin with (that is, online income losses do not affect their GDP). Global online advertising is currently a duopoly and challenges to the existing value chain can confront very aggressive opposition: no matter how big the multiplier effect ΔA/Ic, online providers can not compensate their loss with increased revenues in a bigger advertisement market, since ad spend is by definition a fraction of consumers' income. When French newspapers demanded sharing into Google News' business, a modest agreement was settled after harsh disputes, but the same situation in Spain ended much worse for everybody. In fact, threatening the very source of revenues of online service providers could damage their business to the point of making it unviable. Current operating margins for this market go from 25% to 35%, though, which seems to indicate otherwise. As online ad spend per person is actually not that high, we are talking here of potential revenues for the end user of a few dollars a year at most. This would be best provided by the proxy in the form of virtual goods or, in the case of ISPs, discounts in their services. A sorted_vector class that maintains an internal buffer of ordered elements. A spread_sheet class that implements automatic formula calculation. These classes restrict the potential states of their implementation data so that they meet some extra requirements the interface relies on (for instance, the fact that the elements of sorted_vector are ordered allows for an lookup operations, automatic values in the spread sheet are consistent with input data cells, etc.). State can only then be changed by using the provided interface, which takes proper care that the invariant is kept upon exit from any method —and this is all good and desireable. sorted_vector typically only allows for deletion of elements or insertion of new values, and does not provide mechanisms for directly modifying the elements or temporarily rearranging them. spread_sheet might only accept changing one data cell at a time so as to check which formulas are affected and recalculate those alone. This last option is not entirely bad, but incurs serious inefficiencies related to the external allocation of the auxiliary data and the recreation of a new sorted_vector object. We look for design patterns that enable invariant suspension (i.e. unrestricted access to a class internal data) in a controlled and maximally efficient way. This pattern is most suitable when modifications are relatively localized in code. When the modification takes place in a more uncontrolled setting, we need something even more flexible. Here, we move the data out and accept it back again when the user is done with it. data extract_data(); // X becomes "empty"
void accept_data(data& d); // X should be "empty"
At first sight, this seems just as bad as our first example with sorted_vector::data(): as soon as we grant access to the internal state, we can no longer be sure the invariant is kept. The key aspect of the pattern, however, is that extract_data sets X to some empty state, i.e., a state without internal data where the invariant is trivially true in all cases —in other words, X gives its internal data away. How does this meet our requirements of control and efficiency? Control: the invariant of v is always true regardless of the user code: when invoking extract_data, v becomes empty, i.e. a vector with zero elements which is of course sorted. The methods of sorted_vector need not check for special cases of invariant suspension. Efficiency: the data is never re-created, but merely moved around; no extra allocations are required. Class invariants are a key aspect of data encapsulation, but can lead to inefficient code when the class interface is too restrictive for data manipulation, We have described two general design patterns, internal invariant suspension and external invariant suspension, that allow for internal state modification in a controlled fashion without interfering with the class general interface or requiring any type of data copying. We do a formal analysis of the cache-related behavior of traversing a levelorder_vector, a linear array of elements laid out according to the breadth-first order of a binary tree. Ignoring roundoff effects, let us assume that the array has n = 2d − 1 elements and the CPU provides a cache system of N lines capable of holding L contiguous array elements each. We further assume that N > d.
Under these conditions, the elements of level i, being contiguous, are paged to 2i/L lines. The traversal of the array corresponds to the post-order sequence of the tree implicitly encoded, and it is easy to see that this meets the elements of each level i exactly in the order they are laid out in memory: so, given that N > d, i.e. the CPU can hold at least as many lines in cache as there are levels in the tree, an optimal caching scheduler will result in only 2i/L misses per level, or n/L overall. The number of cache misses per element during traversal is then constant and equal to 1/L, which is the minimum attainable for any traversal scheme (like the simplest one consisting of walking linearly the array from first to last). The questions remains of whether we can justifiably hold the assumption that N > d in modern architectures. In the Intel Core family, for instance, the data L1 cache is 32 KB (per core) and line size is 64 B, so N = 512. On the other hand, the maximum d possible in 64-bit architectures is precisely 64, therefore the condition N > d is met indeed by a large margin. 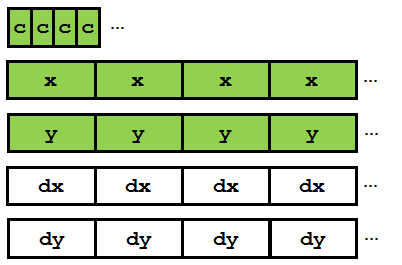 In a previous entry we have introduced the data structure levelorder_vector<T>, which provides faster binary search than sorted vectors (such as sported by Boost.Container flat associative containers) by laying out the elements in a linear fashion following the breadth-first or level order of the binary tree associated to the sequence. As usual with data structures, this is expected to come at a price in the form of poorer performance for other operations. is_last_leaf(i) = i does not have a right child and i + 2 is a power of 2. The last identity might be a little trickier to understand: it simply relies on the fact that the last leaf of the tree must also be the last element of a fully occupied level, and the number of elements in a complete binary tree with d levels is 2d − 1, hence the zero-based index of the element + 2 has to be a power of two. A test program is provided that implements forward iterators for levelorder_vector (backwards traversal is mostly symmetrical) and measures the time taken to traverse std::set, boost::container::flat_set and levelorder_vector instances holding n = 10,000 to 3 million integer elements. Test compiled with Microsoft Visual Studio 2012 using default release mode settings and run on a Windows box with an Intel Core i5-2520M CPU @2.50GHz. Traversal time / number of elements. As expected, boost::container::flat_set is the fastest: nothing (single threaded) can beat traversing an array of memory in sequential order. 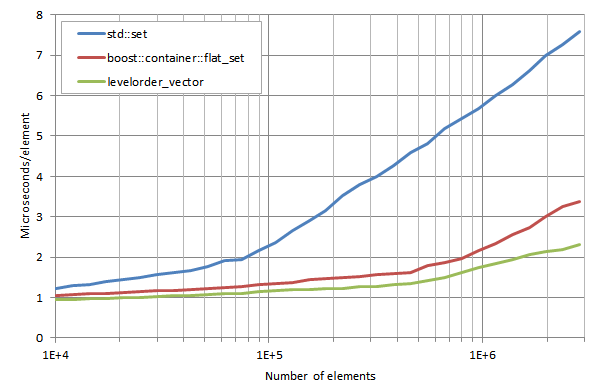 levelorder_vector is around 5x slower than boost::container::flat_set but up to 4x faster than std::set. More interestingly, its traversal time per element is virtually non-affected by the size of the container. This can be further confirmed by measuring a non-touching traversal where the range [begin, end) is walked through without actually dereferencing the iterator, and consequently not accesing the container memory at all: resulting times remain almost the same, which indicates that the traversal time is dominated by the arithmetic operations on indexes. In a later entry we provide the formal proof that traversing a levelorder_vector is indeed cache-oblivious. Contributed by Manu Sánchez (GCC 5.1, Arch Linux 3.16, Intel Core i7 4790k @ 4.5GHz) and Laurentiu Nicola (GCC 5.1, Arch Linux x64, Intel Core i7-2760QM CPU @ 2.40GHz and Intel Celeron J1900 @ 1.99GHz). 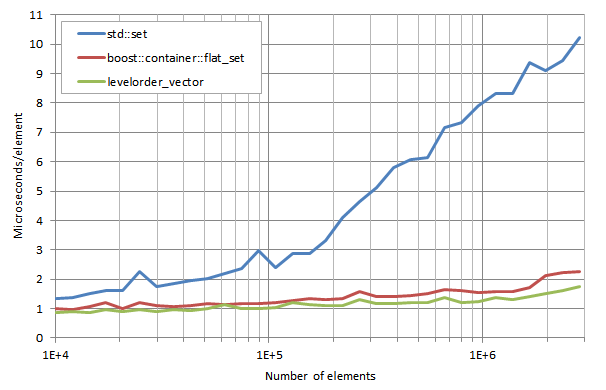 Rather than showing the plots, we provide the observed ranges in execution speed ratios between the three containers (for instance, the cell "10-30" means that boost::container::flat_set is between 10 and 30 times faster than levelorder_vector for Intel Core i7). Clang 3.6.1 with libstdc++-v3 and libc++ Arch Linux 3.16, Intel Core i7 4790k @ 4.5GHz. Clang 3.6.1, Arch Linux x64, Intel Core i7-2760QM CPU @ 2.40GHz and Intel Celeron J1900 @ 1.99GHz. 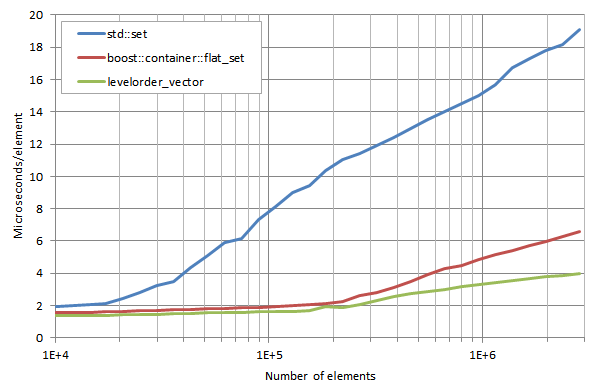 Traversing a levelorder_vector takes a constant time per element that sits in between those of boost::container::flat_set (10-50 times slower, depending on number of elements and environment) and std::set (2-8 times faster). Users need to consider their particular execution scenarios to balance this fact vs. the superior performance offered at lookup. As searching narrows down towards the looked-for value, visited elements are progressively closer, so locality of reference is very good for the last part of the process, even if the first steps hop over large distances. All in all, the process is more cache-friendly than searching in a regular std::set (where elements are totally scattered throughout memory according to the allocator's whims) and resulting lookup times are consequently much better. But we can get even more cache-friendly than that. Now hotter elements are much closer: as cache management mechanisms try to keep hot areas longer in cache, we can then expect this layout to result in fewer cache misses overall. To summarize, we are improving locality of reference for hotter elements at the expense of colder areas of the array. A test program is provided that measures lower_bound execution times with a random sequence of values on containers std::set, boost::container::flat_set and levelorder_vector holding n = 10,000 to 3 million elements. Test built with Microsoft Visual Studio 2012 using default release mode settings and run on a Windows box with an Intel Core i5-2520M CPU @2.50GHz. Depicted values are microseconds/n, where n is the number of elements in the container. lower_bound execution times / number of elements. The theoretical lookup times for the three containers are O(log n), which should show as straight lines (horizontal scale is logarithmic), but increasing cache misses as n grows result in some upwards bending. 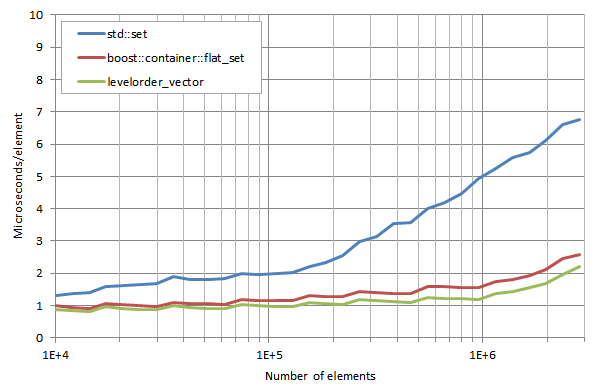 As predicted, levelorder_vector performs better than boost::container::flat_set, with improvement factors ranging from 10% to 30%. Both containers are nevertheless much faster than std::set, and don't show much degradation until n ≃ 5·105 (~7·104 for std::set), which is a direct consequence of their superior cache friendliness. 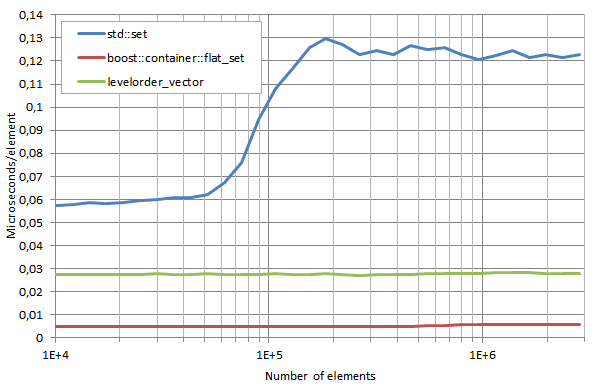 Although levelorder_vector performs generally better than boost::container::flat_set, there is a strange phenomenon for which I don't have an explanation: improvement factors are around 40% for low values of n, but then decrease or even become negative as n aproaches 3·106. I'd be grateful if readers can offer interpretations of this. 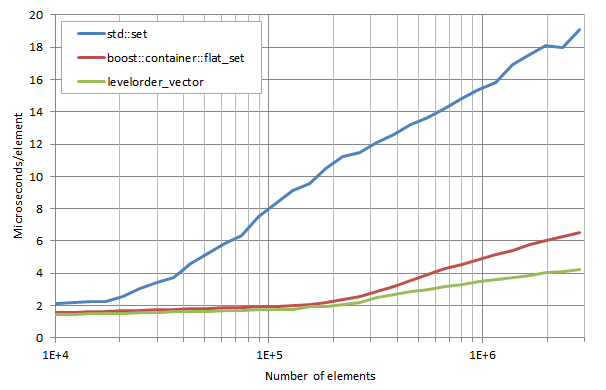 -march=native seems to make a big difference: now levelorder_vector execution times are up to 25% (i7) and 40% (Celeron) lower than boost::container::flat_set when n approaches 3·106, but there is no significant gain for low values of n.
As provided by fortch: clang-500.2.79 in -std=c++0x mode on an Darwin 13.1.0 box with an Intel Core i7-3740QM CPU @ 2.70GHz. 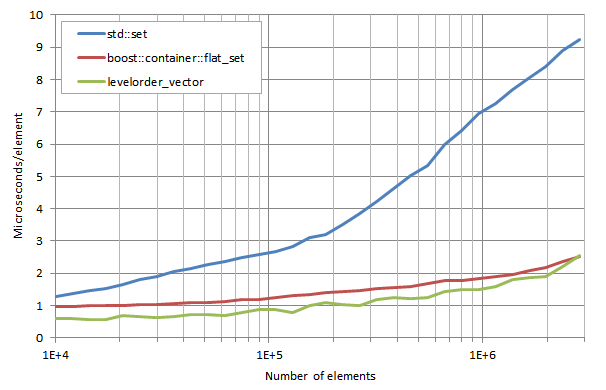 The improvement of levelorder_vector with respect to boost::container::flat_set ranges from 10% to 20%. 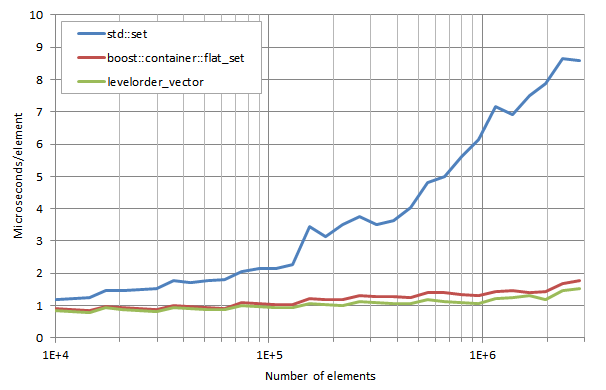 Results are similar, with levelorder_vector execution speeds between 5% and 20% less than those of boost::container::flat_set. The very noticeable bumps on the graphs for these two containers when using libc++ are also present on the tests for Clang on OS X but do not appear if the standard library used is libstdc++-v3, which suggests that they might be due to some artifact related to libc++ memory allocator. 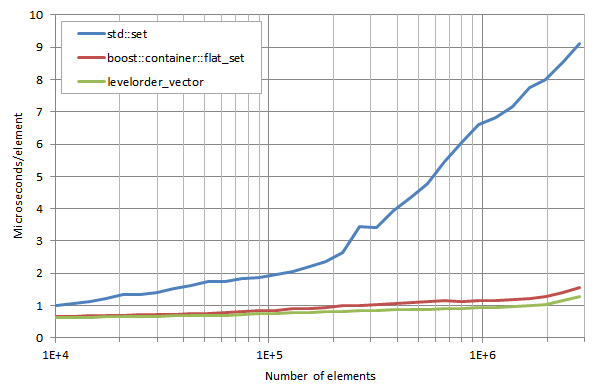 where levelorder_vector execution times are up to 35% lower than those of boost::container::flat_set. Even though binary search on sorted vectors perform much better than node-base data structures, alternative contiguous layouts can achieve even more cache friendliness. We have shown a possibility based on arranging elements according to the breadth-first order of a binary tree holding the sorted sequence. This data structure can possibly perform worse, though, in other operations like insertion and deletion: we defer the study of this matter to a future entry. Mas has discarded the possibility that CiU's defeat in Barcelona has been influenced by the party's pro-independence discourse. "Madrid might also have a mayor from Podemos, and there is no independentist movement there", he said. Is Mr. Mas's argument sound? Let us analyze it formally. It is not the case that ∀x i(x) → p(x) because ¬i(Madrid) ∧ p(Madrid). Put this way, the argument is blatantly false: a refutation of ∀x i(x) → p(x) would ask for a city with a pro-independence governing party where Podemos did not succeed, which is not the case of Madrid. Let us try another approach. D = (P / N) − (PI / I) ≥ 0.
which is always non-negative (since P' is never greater than N − 1), and furthermore strictly positive if P' < N − 1, that is, if Podemos has lost somewhere (which is certainly the case). So, knowing about the existence of counties without pro-independence councils where Podemos won increases the chances that, in effect, D ≥ 0 and, consequently, independentism not play a beneficial role in the success of this party. But if this knowledge is of just one county out of the hundreds where Podemos ran, the degree of extra confidence we gain is extremely small. This is the very weak sense in which Mas's argument can be held valid. 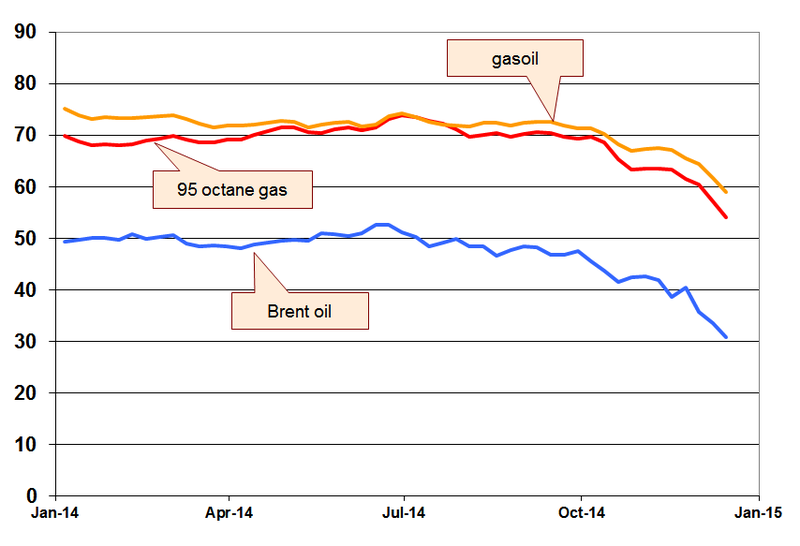 Retail gasoline and gasoil prices from the European Commision Oil Bulletin. 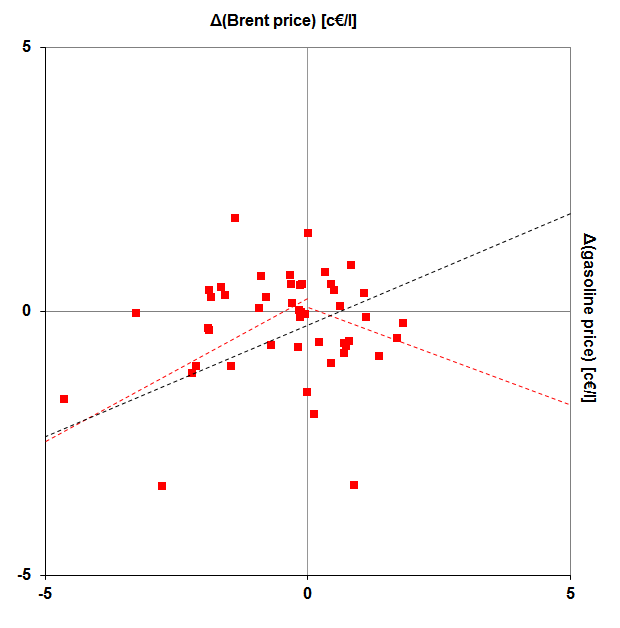 Brent oil spot prices from the the US Energy Information Administration. Euro to dollar exchange rates from FXHistory. 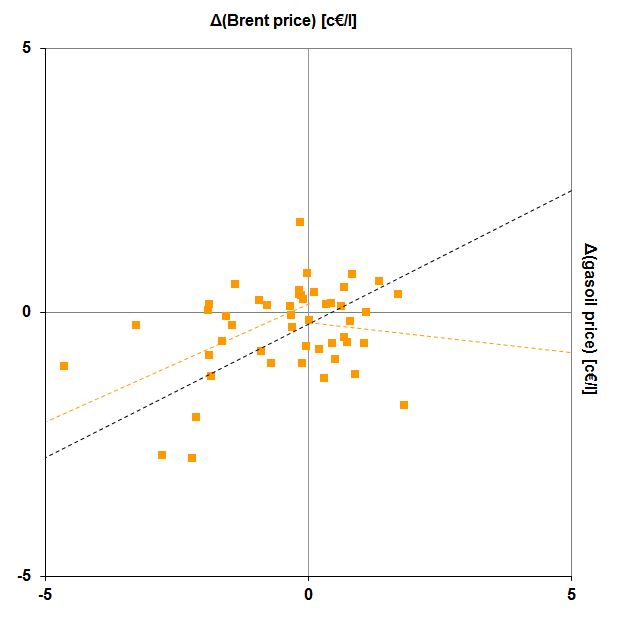 The figure shows the weekly evolution during 2014 of prices of Brent oil and average retail prices without taxes of 95 octane gas and gasoil in Spain, all in c€ per liter. y = f(x) = b + mx = −0.2489 + 0.4208x. which is qualitatively similar to the behavior for gasoline. In both cases, retail prices under constant oil prices (that is, when ΔBrent is small) have reduced around 0.2c€/l per week. So, oil's fall during the second half of 2014 has of course resulted in a general reduction of gas prices, but these were are also showing a correction trend during the first half of the year, when oil rises were translated less strongly than drops. At least for 2014, we haven't found evidence of the "rocket and feather" effect fuel companies are usually suspected of.